Montserrat Opening of Festival 2015 live | ComeSeeTv Broadcast Network ... Can you See me Now! Montserrat Opening of Festival 2015 will be live on zjb.gov.ms powered by www.comeseetv.com on Friday December 18th, 2015 from 6pm. 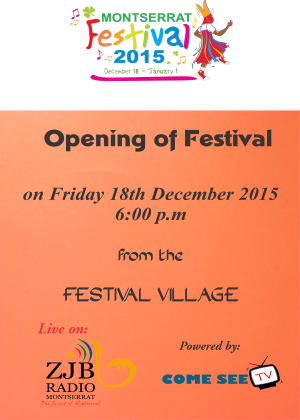 Montserrat Opening of Festival 2015 will be live on http://zjb.gov.ms on Friday December 18th, 2015 from 6pm.